Speaking of timelessness… The delicious irony about all the legendary colonial hotels in the region is that change had come often drastically to these grand old dames, in order that they may look as though no change had touched them at all. 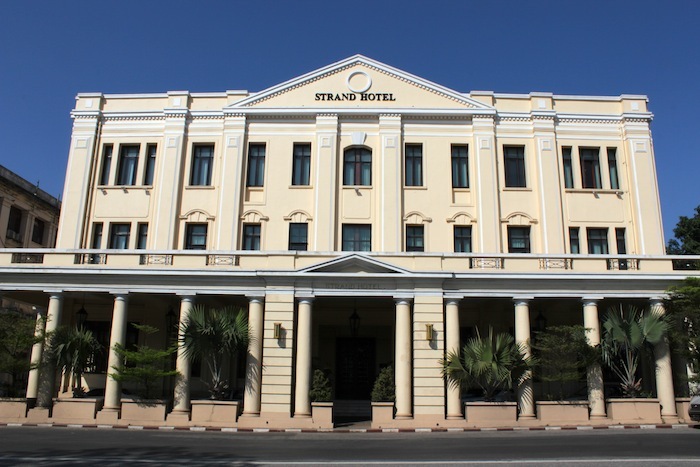 The Strand Hotel in Yangon certainly looked, both outwardly and inwardly, as though it still stood in Victorian Rangoon, despite, or perhaps because of a significant restoration and refurbishment effort in the late ‘90s. 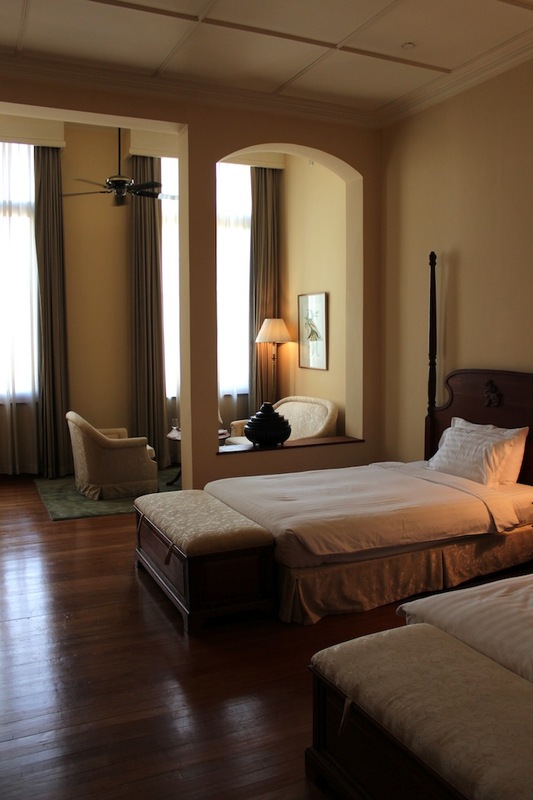 Opened in 1901, the hotel is the third and last extant property established by the illustrious Sarkies Brothers. It was the brainchild of Aviet Sarkies – the youngest of the brothers, and his older brother Tigran, who had established the Raffles Hotel in Singapore. It is the shortest-lived of the Sarkies hotels, having only remained in the Sarkies brothers’ possession for 24 years – they would sell it to a fellow Armenian businessman in 1925. In the early 1900s, the Strand sat across a small road from a large waterfront park on the banks of the Rangoon River, near the port of Rangoon. Today, this road – Strand Road – is a huge and busy multi-lane thoroughfare that is notoriously difficult to get across and makes taking shots of the hotel exterior fiendishly difficult. Strand Road is lined with almost a dozen of the most impressive colonial-era buildings in the city, and strongly recalls the Shanghai Bund. In those days, British tourists, alighting from their luxury cruise liner from Calcutta, would have found the view from their hotel shuttle most familiar and edifying, a pompous display of the wealth, might and power of the Empire. 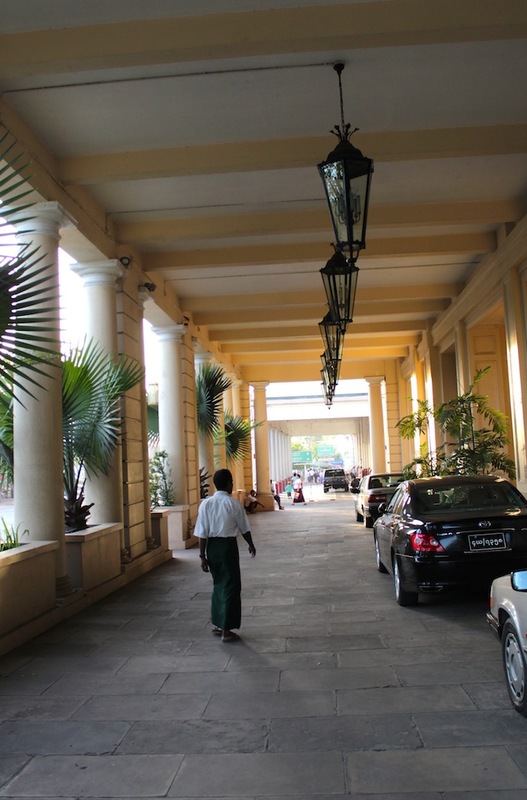 A short ten to fifteen minute ride in the carriage later – the port was within eyeshot of hotel then, as it still is today – guests would be deposited at the entranceway to the hotel, and ushered in by a waiting Sikh footman (a Burmese footman in traditional longyi today). Entrance to the hotel, and longyi-clad doorman. Once inside, the view they would have taken in would have been pretty much the same as today’s; which is to say, that the traveller would have stepped into a delightful, other-worldly paradise of palm trees, marble floors, wicker chairs and leisurely whirling fans. The ambience would have been convivial – there would be a slight buzz of activity and symphony of human voices from fellow guests having afternoon tea in the lobby lounge, or gin pahits in the hotel bar. Secreted at the corner of the lobby, one might spy a novelist or journalist, leisurely taking notes while smoking a cigar. Service would be close to impeccable. Our traveller would be whisked up to the suite in a matter of minutes, followed by his entourage of boxes, trunks and manservants, ready to commence his month or even year-long residence in this home away from home. Fig. 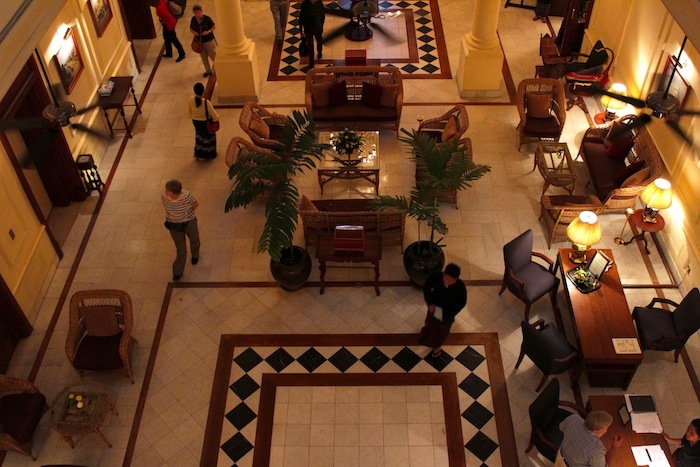 10 – The hotel lobby, in the afternoon. My experience that first morning at the Strand resembled this fanciful idyll, save for minor differences – the hotel was exceedingly quiet (a busload of tourists would show up later that day), and the lilting melody of a Burmese xylophone completed the illusion of my having been stepped back in time. I had arrived slightly early, and while waiting for my room to be prepared, the concierge sat me down and explained, in almost impeccable English, what the hotel’s services and amenities were. I was informed, to my delight, that I had been upgraded from a Superior to a Deluxe Suite. And then butler promptly appeared, genie-like to take me up to my suite. Which was, in a word: sumptuous. There simply wasn’t any other word to describe it. It was the largest hotel room I had ever seen both in floor area, and in height. The ceilings must have been a good four meters, and there were separate writing, sitting and bathing areas, as well as a walk-in closet and walk-in boudoir. What was most magical about the space however, was the light – which streamed in through the mile-high windows and suffused the space with a homely glow. My room: the Deluxe Suite, complete with 4-metre high ceilings and heaps of character. My butler sat me down at the writing desk, where all documentation had already been prepared. With a quick flash of a pen, the suite was mine (for two days at least). As a special touch, I had been given a complimentary bottle of chardonnay for my stay, and my butler asked if I did not want to sample it there and then. I said “no thank you, it was a little too early in the day for wine,” and sent him on his way politely, before hooting like a child and diving onto one of the beds to luxuriate in the fresh, lightly scented sheets. Sunlight streaming through the Strand Café. Apart from the Raffles Hotel in Singapore, the Strand is probably the most literary of the grand hotels in Southeast Asia. Since Rangoon was the gateway to the Far East, everyone with any intention to get to Asia, would have had to pass through here. And if they were visiting royalty, or merely obscenely wealthy, they would have had a suite at the Strand. It was here, that Rudyard Kipling supposedly wrote part of The Jungle Book. Here, that George Orwell purportedly penned parts of Burmese Days. Here, also, that Somerset Maugham, ensconced in the corner of the Bar, observed and took notes for what would become his book of short stories, The Gentleman in the Parlour. 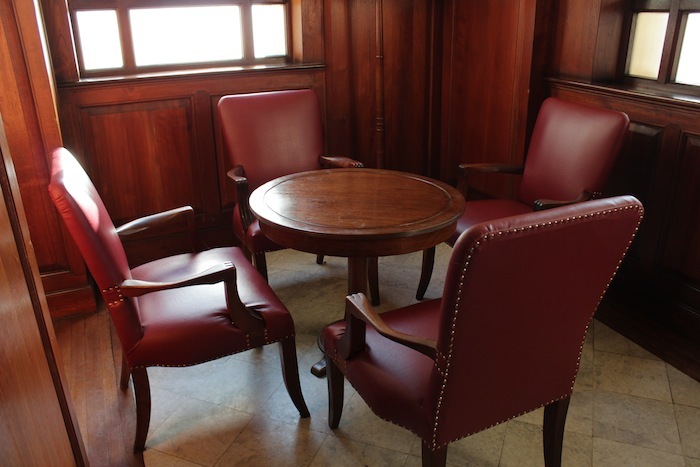 Corner table at the Strand Bar where the likes of Noel Coward and Somerset Maugham may have sat at. Since I was clearly not an Englishman, I must have been a mad dog, for after an energetic spate of rolling around in my bed singing ditties from the 1920s, I stepped out into the noonday sun for my photoshoot of the colonial quarter. I returned close to sundown, and headed straight for the Strand Bar for their famous Happy Hour (5 – 11 p.m.), popular with expatriates and (Western) tourists. 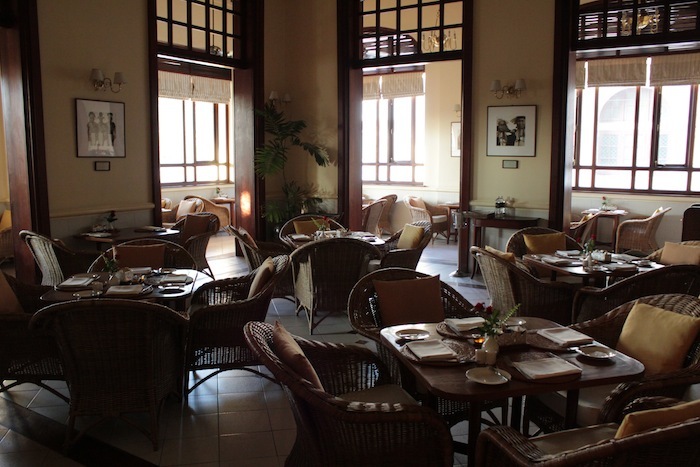 The Bar, oozing colonial atmosphere, was still empty when I arrived and I got to talking with the only other person seated at the bar, who happened to be an expatriate academic and expert on Burma’s political economy. Without going into too much detail, we got to talking heatedly about cities, culture and the economy in Southeast Asia, in London (where he was from), and in New York (where I had just moved back to Singapore from). As we talked, the bar gradually filled up and by 8 p.m. the place was so packed that there was hardly any space even to think. I was surrounded by French, Spanish, American and English voices, and the occasional Japanese and Korean. Some things don’t change, I thought to myself. Then, as now, the Strand Bar would have been the place to be to meet a fellow traveller like one’s self, or some other interesting person, and to engage in a conversation about everything under the sun. 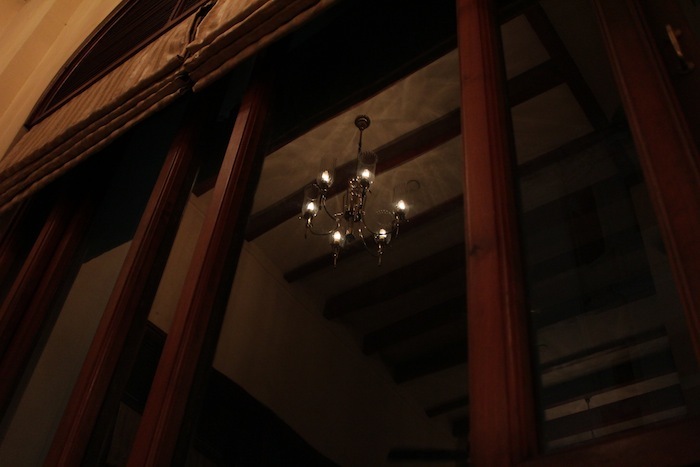 Reflection of a chandelier at the Strand Café. Finally bidding my goodbyes at 9.30 p.m., four and half hours and five glasses of wine after, I adjourned for dinner. 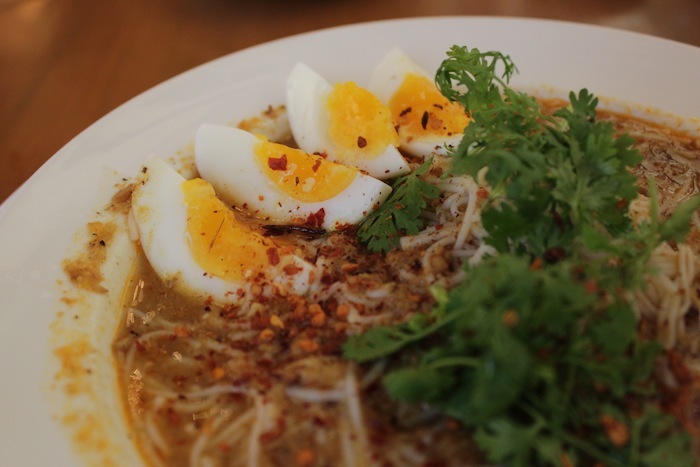 The manager of the hotel – whom I had briefly met at the Strand Bar, had rather kindly suggested I check out a list of fine Burmese restaurants in the suburb of Ahlone. But, since it was rather late, and I was spectacularly drunk, I decided it was best to stay in for dinner. Eschewing the Western Menu at the more formal Strand Grill, I opted for local flavours at the Strand Café. The atmosphere in there – in stark contrast to the heaving Strand Bar – was ghostly but evocative. I contented myself with a not-so-bad Burmese Tea Salad Trio, and staggered back to my room, done for the day. Mohingya: the typical Burmese breakfast. The morning of departure, I went down to the Strand Café as usual for breakfast and opted for a Burmese breakfast staple – the mohingya, which is rice noodles suspended in a thick fish-based stew, enhanced with a variety of pungent Burmese spices, as well as aromatic slices of edible banana stem. That, at least, is the mohingya I’m used to having at my favorite Burmese restaurant in Singapore. The mohingya I had at the Strand was insipid and flavourless, completely neutered to cater to European tastes. It didn’t even look like a typical mohingya, which presents a somewhat messy and unappetising appearance and odour to the uninitiated, as does most other Burmese cuisine. The curry chicken noodle I had the morning before – the only other Burmese item on the breakfast menu – had been similarly uneventful, and it made me wonder if it was the lack of demand (all the other Western guests at the café invariably ordered the American-style breakfast) that made the quality of local offerings so, well… uninspiring. The same could not be said of the merchandise available in the hotel’s shopping area. After breakfast, I spent some time browsing through the numerous arts and indigenous craft stores housed on the ground floor of the hotel, intent on purchasing a gift for my mother, whose birthday it was that very week. The stores were well stocked with everything from gigantic wooden carvings and statues to tiny vinyl figurines of Burmese hill tribes. The ambience was deliciously period, reminding me of a Victorian-era museum of ethnography and curios (Sir John Sloane’s Museum in London came to mind), with every single item on display being largely a unique piece. I felt not unlike a Victorian antiques collector on a quest, patiently scrutinising and handling every single piece in a bid to uncover a treasure. As it was, my efforts paid off. I discovered, amidst all the bric-a-brac, a black lacquer jewellery box adorned with a gold rose. It wasn’t big, but it spectacularly beautiful (and a success with my mother). 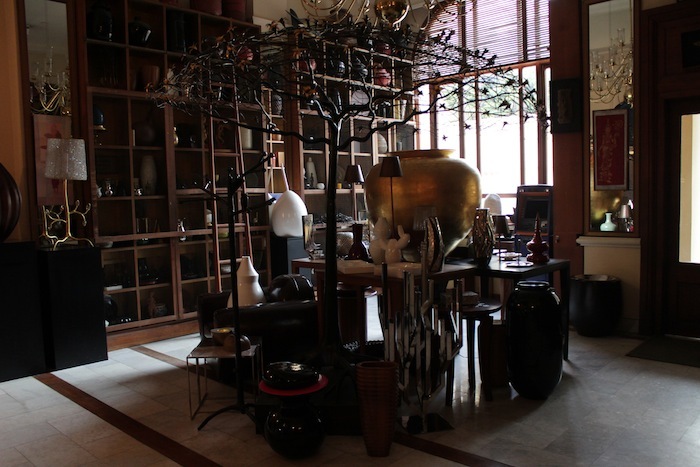 The Hotel Shoppe, like a 19th century Museum of Curios. Back in the room, I finally got the butler to pop open my complimentary bottle of chardonnay so I could soften the wait till departure. I offered him a glass of wine in an attempt to find out more about his life and his experience in the hotel. But, bashful and perhaps adhering to the Hotel’s policies, he politely declined. As I sipped at my wine and reflected on my experience at the hotel that weekend, I thought that the most memorable part of my stay had been the quality of the service, in particular that of the 24-hour team of butlers stationed on each floor, and who, each time I stepped out of my room, far down the corridor from the second floor landing, could be seen rushing out from whichever room they were attending to at the moment to greet me and ask if I had not had a pleasant afternoon or evening so far. They were all very attentive to me, since I was quite likely the youngest and very possibly the only Asian guest in the hotel that weekend (“Where you from, sir?” “I’m from Singapore.” “Ah! !”); and since also, I had had a series of minor “mishaps” in the room (my bathroom lights didn’t work and had to changed; and then I accidentally touched and smashed one of the light bulbs, which had to be dealt with; and then I made a complaint about the water running into the bath, which was disconcertingly sepia-toned), which had me fixed rather prominently on their radar the day I checked in. 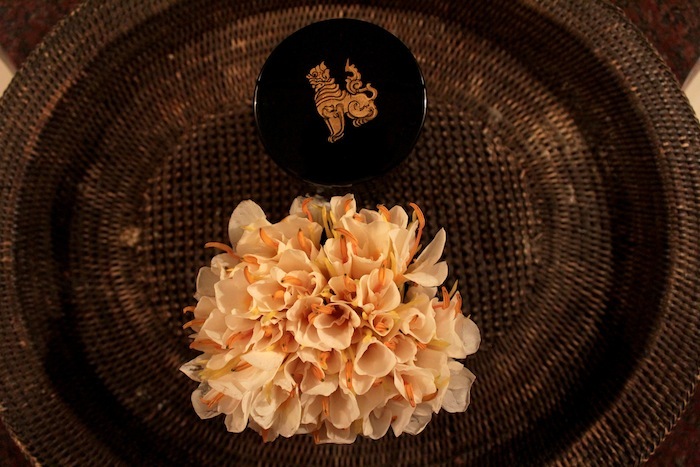 In my bathroom: a bouquet of deliciously scented local flowers, and a lacquer box with the hotel’s logo. I am a fair person, however, and I could honestly say that everything that was imperfect about the Hotel was more than compensated for by the professionalism and personableness of its people. And that, ultimately, is the mark of a good hotel establishment, whether at the turn of the 19th century, or the 21st. I left my butler a massive tip in appreciation for his team, since he could not accept the glass of wine with me. Andreas Augustin, 2001. The Strand Treasury (E-Book). The Most Famous Hotels in the World. Michael W. Charney, 2009. A History of Modern Burma. UK: Cambridge University Press. W. Somerset Maugham, 1935. 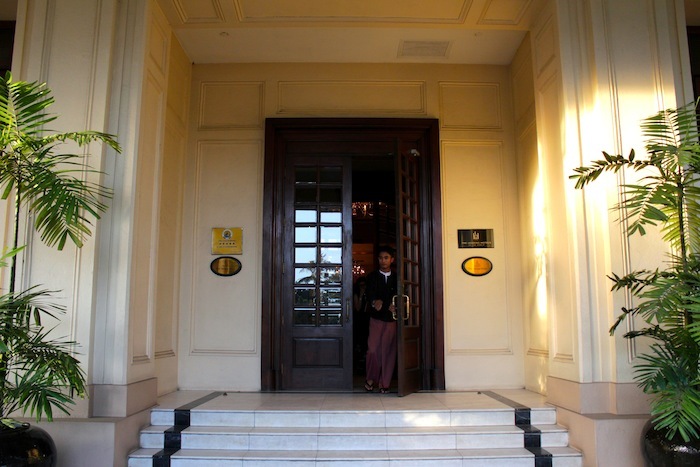 The Gentleman in the Parlour: A Record of a Journey from Rangoon to Haiphong. UK: White Orchid Press. George Orwell, 1934. Burmese Days. UK: Oxford City Press. The iconic driveway to The Strand Hotel. Gallery | This entry was posted in Art & Architecture, Cities & Regions, Culture & Lifestyle, Literature & Philosophy, Photography, Travel & Mobility and tagged Burma, Burmese Days, Mad Dogs and Englishmen, Myanmar, The Grand Tour, The Grand Tour of Southeast Asia, The Strand Hotel, Yangon. Bookmark the permalink.